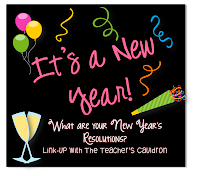 I am linking up with The Teacher's Cauldron for her New Year's Linky Party!! Well it is that dreaded awesome time of year again...time for new beginnings and resolutions to do better this year. I have to begin by saying that last year was a GREAT YEAR! I actually did follow-through on a few of my goals...kinda sorta. The best part of 2012 has been (finally after two years) feeling comfortable in my new role as third grade teacher (I taught first grade for 17+) years and moving up was a big, huge step! I am really loving it now. The other best part of 2012 has been starting my blog and discovering Teachers Pay Teachers. I only started in November and I am hooked. It is so awesome linking up with teachers around the country and across the globe. I also think it is amazing that other teachers are willing to pay me for the resources I create and use in my very own classroom. The best thing about TPT, however, is being able to instantly find the very thing I need for a lesson, at a moment's notice (So far, I spend WAY more than I make on TpT)!! My personal resolution would be...uh...hmmmmm...this is so hard....there are so many directions I could go here. I want to work on being a well-rounded, balanced person. I tend to get overly-focused on one thing and become obsessed with that ONE thing for a while, usually at the expense of everything else. This summer I was on a fitness kick....right now its my new blog and my TpT products (I really need to leave this chair and reintroduce myself to my family). So, I am saying it outloud for the world to hear....I need to create balance and prioritize the really important things in my life. Wish me luck. I am still very new to blogging but I'd really like to do a better job of articulating who I am as a teacher. That is the beauty of blogging...it is a journey of self-discovery, I think. Holly over at Criss Cross Applesauce in First Grade said that she wants to blog more about the day-to-day stuff in her classroom. I love that idea. I think that is where we can learn the most of ourselves and each other...by the things we do every day within those four walls of our classroom. I hope to post at least twice a week in 2013 and I would love to do a weekly repeating thing (like the Friday Freebie...I think from the 3AM Teacher). So that's about it for my resolutions...whatchya think?? On to the GIVEAWAY!! This is a first for me and I really don't know what I'm doing, but I'm going to give this rafflechopper thingie a try. 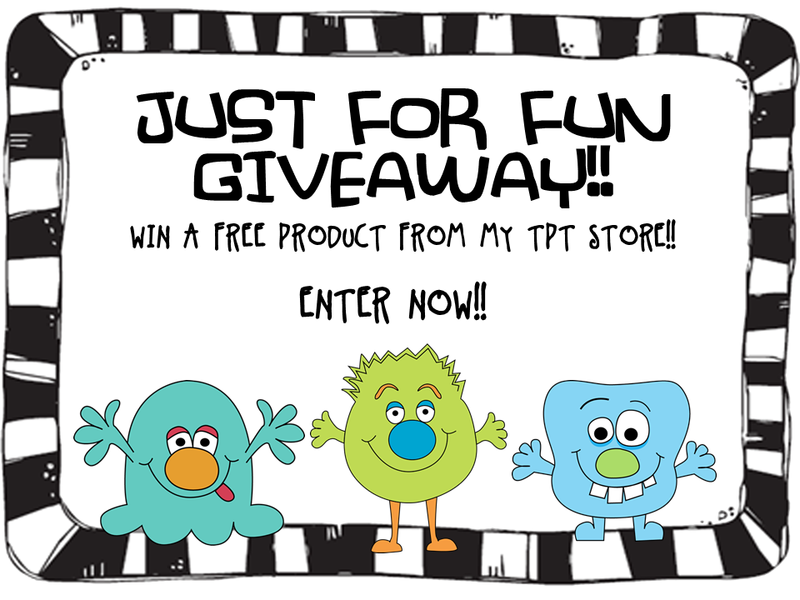 I hope you enter...the prize is any one thing from my TpT store...your choice! Toodles for now and Happy 2013!! Thanks for stopping by my blog! 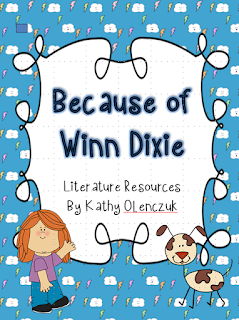 I taught third for four years, and it has my heart, so I LOVE finding third grade blogs! :) I think your goals sound great! Happy New Year! I love the balance that needs to be put in place, I am so needing your advice! I'm happy to be your latest follower. So happy to be part of your blog. Blessings in 2013! HI Kathy! Thanks so much for stopping by my blog! I love finding new 3rd grade blogs. I am a new followers. I'm right there with you on the balance. When I began blogging back in February, my exercise and healthy eating habits went out the window for a bit. I was spending too many late nights working on all of those things. Then finally I was able to get myself in a groove this past summer and make time for healthy eating and exercise while limiting myself to how much late night time I spent on blogging and making products. Good luck! Happy New Year!! Balance - key to life, I tell you. Wish I could come close to finding it!!!! I think the biggest hinderance for me in terms of blogging is thinking it always has to be some big A-HA moment for my readers...nope, I think they'd be okay with the daily grind stuff because relating is validating. Oops...I left a comment on the It's a Sale post instead of this one! I hope that counts toward this give away! I'm working on balance in my life as well...not just school, school, school! Happy New Year! This is a great giveaway! Kathy, I tried to leave a shout out on your TPT store page but was not able to reply. So I am sharing my excitement here instead! I am so thrilled to be chosen to receive The Ultimate Partner Reading Guide! It looks like a great way to have my students read with a partner...plus getting doubles of books through Scholastic is a winner! Thanks again...and Happy New Year!